Shelburne’s Town Manager Paul Boehne has got that certain sense of humor that can only come from time spent at seemingly endless select board meetings debating the exact placement of municipal streetlights. "Except for dealing with dogs and leash laws, this would be the most controversial project that we ever did!" Boehne said, laughing in his office just off Route 7. Shelburne applied for federal stimulus money two years ago and it got nearly $70,000. With that money, the town did an assessment and decided to eliminate half of its streetlights. With the remaining money, Shelburne converted all of its old, inefficient mercury vapor lights to LEDs, a semiconductor light source that can last for decades. Some people were upset that they lost lights in their neighborhood, but the town saved big. "We had a bill that would have been around $33-$34,000 a year and we cut that to about $7,000," Boehne said. Finding greater energy efficiency is a proposition facing many Vermont communities, and towns hoping to save on energy costs are starting small – not with solar, wind or biomass but with their streetlights. Across the state, there are dozens of town energy committees that are working with state agencies and non-profits to improve their energy systems. Environmental policy makers say converting their municipal streetlights to more efficient ones can save towns between 50 to 75 percent on their energy costs. 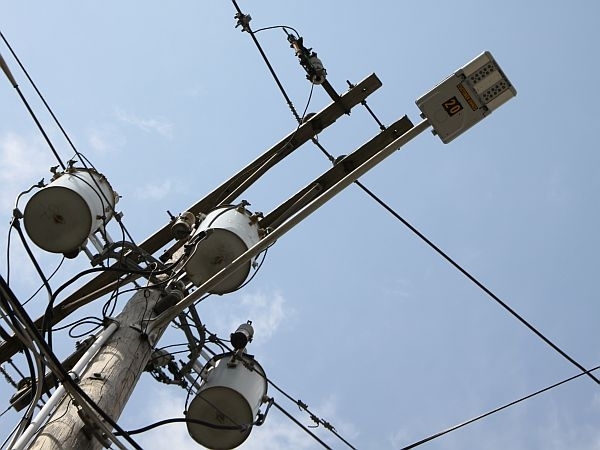 "There is a lot that we can provide in terms of helping them start to think through the process," said George Twigg, Deputy Policy Director at Efficiency Vermont, which is working with towns to assess and convert their lights. Twigg said towns can get the biggest bang for their buck if they consider town-wide projects rather than individual fixtures. "At a time when municipal budgets are really strapped, hopefully this is a way that we can help towns manage that while also providing some higher quality of life and less light pollution." Under Efficiency Vermont’s program, which provides incentives for replacing fixtures, seven communities – Barnet, Bridport, Cabot, Grafton, Hartford, Hartland and Manchester – have completed full changes to their streetlights. More than 60 other towns, including Essex, Warren and Concord, have also expressed interest. Shelburne Town Manager Paul Boehne says making the switch should be a no-brainer for all towns. "You can imagine if you have the kind of savings and electrical use that we had in Shelburne and spread that across the rest of the country," Boehne figured. "That’s a tremendous amount of energy that won’t have to be generated." Converting to LED lights won’t save towns as much as a wind or solar or biomass project, but town officials say it’s a good start. Highway spending is out of balance in several Vermont cities and towns as the cost of gasoline climbs toward a national average of $4 a gallon. Adding insult to injury, there are still two months left in the fiscal year. Vermont Food Bank Executive Director Doug O’Brien says the organization has been seeking an opportunity to grow its own food as part of a long-term strategy for helping stave off hunger in Vermont’s neediest communities. O’Brien speaks with VPR’s Mitch Wertlieb about the purchase of the Kingsbury Farm.